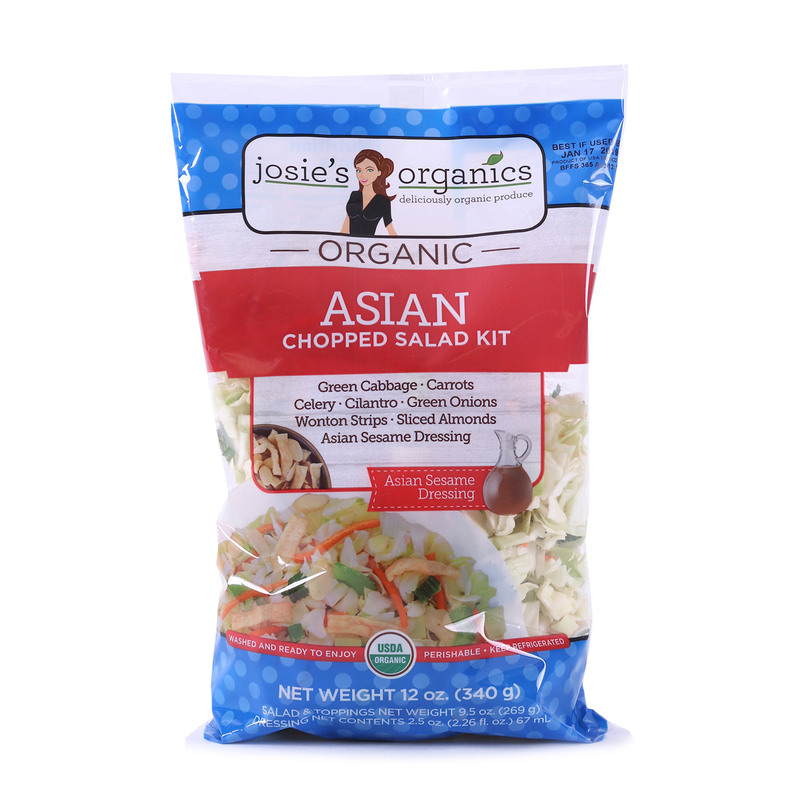 Experience exotic flavors from the far East right in your own kitchen with our Asian Chopped Salad! 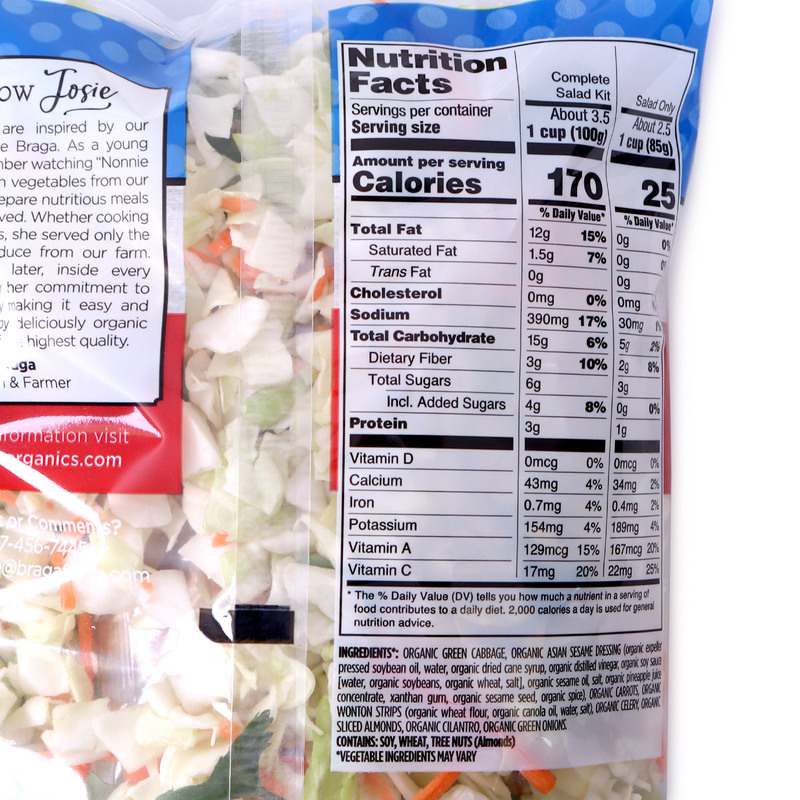 Fresh green cabbage, plus celery, carrots, cilantro, green onions, almonds and wonton strips, make this delicious salad extra crunchy. This sesame dressing adds the perfect tangy finishing touch. This complete salad kit makes a quick and filling lunch or dinner salad. Or get creative and wrap in a tortilla with chicken or tofu. There are so many possibilities! Organic green cabbage, organic Asian sesame dressing (organic expeller pressed soybean oil, water, organic dried cane syrup, organic distilled vinegar, organic soy sauce [water, organic soybeans, organic wheat, salt], organic sesame oil, salt, organic pineapple juice concentrate, xanthan gum, organic sesame seed, organic spice), organic carrots, organic wonton strips (organic wheat flour, organic canola oil, water, salt), organic celery, organic sliced almonds, organic cilantro, organic green onions. Contains: soy, wheat, tree nuts (almonds).